This Fluted Corner Electric Fireplace will fit perfect in the corner of your home or office. Choose from having this handcrafted in your choice of red oak wood or cherry wood and finished in a wide variety of stain and paint options. Display books, collectibles or pictures ontop of the beautiful solid wood mantel. This electric fireplace provide ambiance and warmth without the hassle and mess of wood and pellet burning fireplaces. You just plug in the fireplace and you have a very real looking fire. 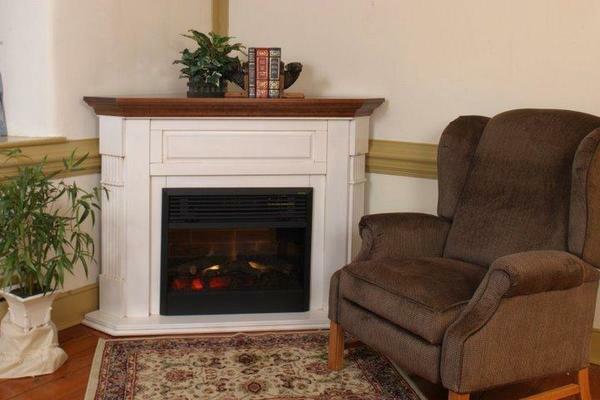 This electric fireplace includes a 120 volt electric fireplace insert with 1500 watt heater. A black trim kit comes standard. An antique brass trim kit is also available. DutchCrafters electric fireplaces use halogen bulbs for the flame and light. The electric fireplace units are not LED. All electric fireplaces come with a remote control which allows you to operate with heat only, flame only or both heat and flame. These Amish crafted fireplaces are simply plug and go. You do not have to fasten them in any way to secure them to the wall. Electric fireplaces are much cheaper than oil or gas but they only produces 5000 btu of heat where a gas or oil would put out a good bit more. They are designed for easy installation and definitely produce enough heat to take the chill off!